Following the end of World War II, collecting firearms has become increasingly popular. The popularity of antique and vintage guns has led to a price spike and a sellers market. Some collectors are on the hunt for specific makes and models, while others seek to collect guns from certain time periods. What Determines the Price of an Antique Gun? A main price indicator of an antique gun is the age of the gun. Generally speaking, the older the gun the more it is worth. Age isn’t the only determining price factor though. Specific brands of guns such as Colt and Winchester are heavily sought after by collectors meaning 9 times out of 10 they will be the highest priced guns at any given auction. Along with the age of a firearm, the condition of it is also a large factor when determining an approximate resale price. There is even a proper rating system for antique guns. A single antique gun can be are classed as excellent, fine, very good, good, fair, or poor in terms of condition. Guns that have been apart of a historical event seem to be very appealing to antique collectors. Guns owned by Hitler and Wyatt Earp are both expensive and highly sought after weapons. The rarity and overall appeal of a gun also impact the current value. The majority of antique gun collectors will purchase them for two main reasons. A Muzzleloader (a firearm that is loaded from the muzzle) is majorly collected for its historic value. These firearms are displayed as works of art. Cartridge-Firing weapons (guns that allow ammunition to be packaged into a firing chamber) alternatively are collected with an intent to use. While some keen collectors do pay the price to display them on a shelf or wall, these weapons are largely collected to take out shooting. Who wouldn’t want to show their latest antique toy off to their friends! You might be wondering now which gun is the most valuable known to man? A single-shot (6 inch) .44 caliber derringer pistol finds itself at the top of the list. This gun was used by John Wilkes Booth to assassinate President Lincoln. This was one of the most notorious acts in all of Americas history making this single firearm priceless. When the term priceless is used, it refers to the fact that this weapon originally manufactured by Henry Deringer will never be sold to one single identity. Experts believe if this weapon was to ever be auctioned, it would be the highest selling gun in history, that is if there was anyone who could afford it! For now, we can view this pistol at the Ford Theater, the place in which the assassination of President Lincoln took place. Although the weapon that killed President Lincoln is thought to be the most valuable, coming in second place would be the gun used to kill president John F. Kennedy. A 6.5mm Carcano Model 91/38 carbine gun was used by Lee Harvey Oswald to murder John F. Kennedy in 1963. Although not technically an antique (just yet), this weapon if ever sold by the American government would be worth well into the millions. A large collection of antique guns owned by famous and infamous men have now changed hands many times at auctions. These guns are purely valuable due to their historic value. Two pistols gifted to George Washington that were used by him during the Revolutionary war were sold in an auction during 2002 for close to two million dollars. 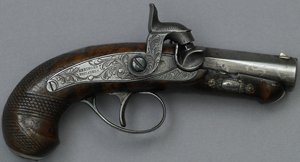 These pistols are steel mounted and both featured silver and gold inlays and carvings making them not only working weapons but also works of art. The two saddle pistols were gifted to Washington by French friend, Marquis de Lafayette. Washington always kept these two pistols close by right up until his death. These pistols were purchased by Richard King Mellon Foundation who donated them to the Fort Ligonier Historic Museum near Pittsburg. These two pistols were designed by gunsmith Jacob Walster. 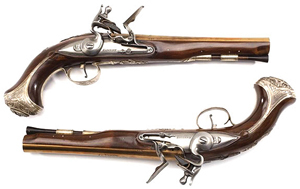 A pair of flintlock pistols owned by military leader Simon Bolivar were auctioned during 2004. These pistols sold for $1.76 million dollars. These pistols were in high demand due to this particular military leaders work to liberate Columbia, Peru, Venezuela, Panama and Ecuador. Bolivar himself was a keen firearm collector and these pistols were amongst the most sought after within his collection. These silver mounted flintlock pistols were originally crafted by Nicolas Boutet in 1824. This gun is not only valuable because it was owned by Sam Wilson but also because it was designed purely to be used by the Texas Rangers. Originally owned by Sam Wilson in 1847, this black powder revolver was said to be one of the most powerful handguns of it’s time. 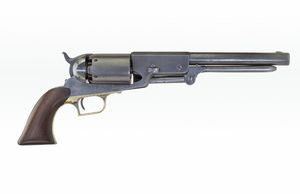 With only 1, 100 Walker pistols ever created, with very few remaining in working condition, it is no surprise that this particular gun sold for close to 1 million dollars in 2008. It is estimated only 200 Colt Walker Pistols still exist. Owned by the 26th president of the United States, Teddy Roosevelt, this shot gun sold for close to one million dollars in 2010. Roosevelt served between 1901 and 1909 and was known for his keen interest in hunting. The shotgun in question was created especially for him by the ‘Fox Gun’ company to take on an African Safari towards the end of his presidency. The 44-caliber Smith and Wesson that killed infamous Jesse James sold for $350, 000 during 2003. Jesse James was well known for running a gang that carried out many bank and train robberies during the 1800’s. The gang became notorious for robbing 20 banks and stealing over $200, 000. A bounty eventually was placed on Jesse James’ head and a fellow gang member shot him to receive the money. This gun in question was used to commit the crime of killing a fellow gang member. A pistol owned by Hitler that was gifted to him by Carl Walther sold at an auction for $114, 000 in 1987. The pistol was taken in 1945 and was returned to the United States where it remains today. 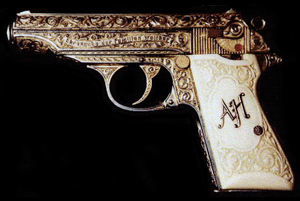 This gun was personalised with the letters ‘AH’ on the side as it was gifted to Hitler for his 50th birthday. The golden letters are based on white ivory. It is estimated if this gun was to be resold today, it would be worth more than $1, 000, 000. Even though this gun is extremely valuable, many would be surprised to learn that it was never holstered or fired by Hitler himself. A collection of antique guns that have found their current value due to the demand for a particular make or model. The craftsmanship and materials used to create and decorate these guns have also added to their value. This pocket revolver was similar to the Paterson model although what made this particular model special was the material it was crafted with. 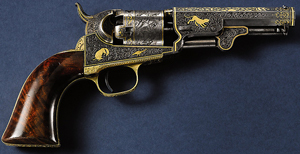 The Gold-Inlaid Colt Model featured real solid gold. This handcrafted gun became so valuable due to it’s visually appealing nature… and the fact it was partly made from pure gold. Patented by Samuel Colt during 1836, this particular gun was the first ever repeating pistol. The Colt Paterson Revolver was manufactured in Paterson, New Jersey where it’s revolving cylinder was created. The revolving cylinder of this gun allowed it to be the first ever repeating firearm. The gun that sold at auction was in pristine condition for it’s age, and due to it’s historical value it went for just under 1 million dollars. Sold during 2017 for $414, 000, this Singer 1911 firearm became the most expensive of it’s kind. This WW2 firearm is one of only 500 ever produced by the Singer Manufacturing Company. 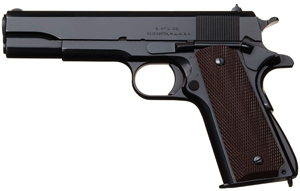 Due to it’s great condition and the demand at the auction, this pistol is thought to be the most expensive 1911 firearm sold designed by any given company. Sold during 2017 was a Winchester model 1873 Saddle Ring Carbine. This antique riffle features a 20 inch barrel and was sold with a letter from the Firearms Museum. The age and desire for this weapon led to the high auction price.